We're celebrating education this September as students around the world head back to school. Here at Kiva, we strongly believe that education opens doors -- and we're thrilled to have so many lenders who are passionate about funding education loans. Today, we're spotlighting three of these lenders, Carolyn Clarke, Ramona Lichtenthäler and Charmaine Pettersen. Hear what they have to say about choosing, and how and why they lend to help others across the globe get the educations they deserve. Kiva: Why do you feel passionately about education loans? Carolyn: Education is a human right! I had education opportunities because of government grants and loans, and my son had scholarships and loans that gave him access to higher education that I couldn’t have provided. I feel passionate about education because I believe it’s the pathway not only out of financial poverty, but equally important, poverty of the spirit which prevents people from believing in their ability to be more in life. Kiva power-lender Carolyn hails from Toronto, Canada. Kiva: Who have you funded? Carolyn: So far, I have funded 66 loans. Almost every one of my borrowers has a narrative that speaks to the desire for education for themselves or their children. Me and other members of my team, Education Generation, refer to some of these loans as the “hidden” education loans because the borrower may need the loan for business but the long term goal is to fund someone’s education with the profits gained. I have lent to these types of borrowers in Guatemala, Peru, and Uganda. 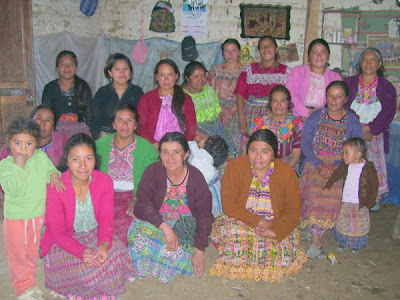 Carolyn's Kiva investments include the Choqui Group in Guatemala (above). One of the group's borrowers, Josefina, founded her own textile business with just two years of education. A mother of eight, she's determined to keep all of her kids in school. Kiva: How do you choose who to lend to? By gender? Country? Ramona: It's the story that influences me most. Like my loan to Intisar, who is 30 years old and couldn't continue her studies when she was younger. But she kept her goal of getting a college education in mind until now. Many great education loans are pointed out to me by members of my two favorite lending teams, Education Generation and Teachers Rock! Kiva lender Ramona, based in Berlin, has made over 2,700 loans! Kiva: What would you like to see Kiva do with education loans? Ramona: Keep continuing to expand to more new countries! Ramona contributed to Alimatu, a widow in Sierra Leone with three children between ages 10 and 21. Working 12 hours 7 days a week selling pots and pans, her goal is to educate all of her children. Kiva: Where are you from, and how long have you been a Kiva lender? Charmaine: I am an American living in Norway, and I've been a Kiva lender since 2007. Charmaine has made over 2,300 loans, including one to Florence to buy desks for her child care center in Kenya. She dreams to one day hire more teachers and turn it into a school. Kiva: Why do you enjoy lending on Kiva? Charmaine: When I first joined Kiva, it was a one time deal. I'd make one loan then wait for it to pay off and then pick a new one. When the new system went into place and repayments started coming every month, the filling up of the account to make another loan started happening. I then found kivafriends.org, and through the chatroom, Kiva kind of took on a life of its own. I have even traveled to Ethiopia to visit the Hamlin Fistula Hospital with a friend from the chatroom. Kiva couldn't be happier to have so many engaged lenders! Huge thanks to Carolyn, Ramona and Charmaine for speaking to us for this blog post. Are you interested in supporting more education loans? Check out lending team Education Generation for good leads, or click here for all education-related loans. Want to multiply your impact? Share Kiva Free Trials with your friends so they can make a loan and experience the power of Kiva free of charge. This month, we're partnering with Dermalogica to offer 4,000 Free Trials at kiva.org/women. Help us spread the word!